I've always held the Californian Superbike School teachings and techniques in highest regard; I haven't found anything that's much better and never heard anyone say anything negative about it. Recently, a blog post by Simon Crafar of Motovudu caught my attention where he singled out CSS for causing him a lot of problems in his coaching and limiting riders with how far they can proceed. So I investigated further and found one of the biggest things appears to be his views on corner entry when compared to CSS. It is also different to my, and others, understanding of it. Simon advocates for a "closed throttle corner entry" whereby the front brake is released earlier using maximum engine braking and even combined with rear brake on entry to get the bike to turn it's maximum. My understanding is most top riders want to reduce their "dwell time" between brake and throttle, preferably to none. Some even overlap slightly picking up the throttle with the front brake still on slightly. My understanding of this is that it maintains a steeper steering geometry which assist with cornering the bike. Hey James. Welcome to the forums. Apparently this is really on your mind since this is your first post. I'm a multiple "repeat offender" student with the school. I have done CSS for many years and have gotten a lot out of their program. What's interesting is in the practical world I have also found myself "defending" their techniques. Not all of the techniques that they teach work well for me but enough of them do that its overall been a benefit and well worth the money I paid. When you boil things down to their core components most of the "quibbles" that people have are just minor differences in style. Style is a controversial subject anywhere you discuss it. Styles evolve of course from a riders practical experience. A rider I have gotten a lot of personalized coaching from is Nate Kern. Nate raced BMW Boxers for years which had a big impact on his style due to some of the design limitations. I find his style works better for me then the style that the school teaches because it maximizes ground clearance and makes the bike turn anywhere you want it to. CSS's technique still works but not as well for me in my specific situation. CSS bases their curriculum on the input of thousands of individual students. Their program is based on what works for "most" riders. Due to the nature of their program and the short time that they spend with students it's impossible for them to tailor the program to individual riders needs. So as a result. Some of the techniques work well and some don't depending on the rider and their past experience and personal preferences. Before I started developing my own riding style I found CSS's coaching to be VERY helpful and very informative. As my style evolved a bit I found CSS coaching to be slightly less helpful. Still worth it overall but having to re-adapt to do it "their way" was a bit painful. Unfortunately there's really no way around this as there's really not enough time for them to adapt the program to each individual's style. The coaches would have to spend a LOT more time watching and analyzing to accomplish that. What does all this mean? To me it means that CSS is still a world class school regardless of some minor quibbles here and there over specific things. People tend to dwell on minor differences of opinion to try to invalidate a good training program. While there's some style issues that just don't work for me when push has come to shove and I have been presented with an on track emergency the CSS training I have fallen back on has managed to keep me on the pavement and on two wheels. For me that's the real acid test. Is CSS perfect. No. Are they good? Yes. Are they cranking out Valentino Rossi's in mass numbers? Reality unfortunately prevents that even though that's many rider's expectations. I think Robert's explanation above is well-stated, that CSS teaches a very large variety of riders on a very large variety of bikes, and the goals of those individual riders vary considerably. CSS provides an incredible foundation, provided in a very clear, organized and understandable way, and backed by loads of data and years of continuing research. From that basis of training, a rider may indeed develop their own style, based on their own strengths and possibly on the strengths and limitations of the bike(s) they ride. In my own experience I found that as I became a competent rider and successful multi-championship club racer, I returned to CSS as a Level 4 student (and still do) and I find that the coaches are ALWAYS able to help me make improvements. As I have reached beyond the basic core of training, Keith and his coaches have been able to provide drills and techniques that are not in the books, that I didn't know existed, that go well beyond what Level 1-3 students get to see. Keith has coached multiple World Champions and has a staggering array of techniques at hand, and a knowledge of motorcycle technology that is astounding. Level 4 coaching is an individual program, tailored to the rider and the rider's specific goals. To me the biggest distinction of CSS versus other schools (aside from the sheer organizational excellence) is that every riding or coaching technique can be backed up with solid data and understanding. I have attended other schools and been trained by other pro motorcycle trainers and there is a whole lot of "just trust me" involved in the coaching. While I can usually pick up some ideas, and often can get great specific tips on where to improve laptimes at specific individual track, it has been CSS that has really improved my riding in ways that apply to EVERY track, taught me how to truly control the motorcycle and know exactly what it is going to do, and ride with exceptional safety and consistency, even in the heat of a race. Simon advocates for a "closed throttle corner entry" whereby the front brake is released earlier using maximum engine braking and even combined with rear brake on entry to get the bike to turn it's maximum. I'm not quite clear on the technique you are describing. I agree with this: "My understanding is most top riders want to reduce their "dwell time" between brake and throttle, preferably to none." and this: "My understanding of this is that it maintains a steeper steering geometry which assist with cornering the bike." Are you saying that Simon advocates letting off the brake before turning, and using engine braking and/or rear brake to reduce the front end dive when entering the turn? If so, that sounds to me like a difference in style, that he is setting up his bikes differently on geometry and suspension, possibly to get the bike to "sit" down more overall (possibly feeling more stable on entry) instead of "diving" forward on the forks. My own personal preference is for the forks to compress, to tighten the steering, as I like a very quick steering response. However, a rider that takes a straighter entry line may feel more stable if the bike does NOT compress the forks so much, it would make the handling feel different and might reduce the feeling of the bike dipping in front under braking then raising back up under throttle, which COULD, if set up properly, provide a tighter line on the exits of the corner. I watched the same video James is talking about and I remembered it differently. I thought he said the problem was that CSS teaches people not to trail brake. I wanted to comment that I took CSS 1-3 and it's not true. They do teach trail braking. But perhaps I got it backwards. I don't know. But I do know that CSS and YCRS both advocate for trail braking and most racers do it as well. I think some do it more than others but nearly all do it to some degree. I know Simon is an ex GP racer but as others have said, everything I've learned at CSS has been explained well enough that I have no doubt it's at least one of the correct ways to do it. While I've augmented some of my technique with outside sources, I'll be pretty surprised if I ever disregard my CSS lessons. Proud Knower and Practicer of CSS Techniques. Last year I went to a trackway and took their "school". What I didn't know is that this was the first year of operation for this new TD Org. The significance of that is that the coaching philosophy was derived from YCRS, as that's the background of the instructors. Saying it saved my life is an exaggeration but it turned my frown upside down. I went out the next day and had a lot of fun, understanding WHERE I might want to trail the brakes and where it simply isn't appropriate. It's for that reason, I have reservations about recommending them as a TD org for new riders. IMO they're pushing a misunderstanding which COULD limit riders if they want to try other teaching methodologies or schools. IMO, CSS opens the student up to thinking about their own riding and why and where things make sense. A big thanks to @Hotfootfor helping me work a lot of that out as well. What is TD Org and YCRS? Doohan did a lot of things "wrong" and won a lot of titles. Hailwood came back and used the classic style to beat more contemporary riders 15 years on. Personally, I do not believe there is one universal correct way, and everything else is more or less inferior. Perhaps if all riders were computers, there could be a universal "right". But in the real world, people differ. They learn to compensate, they learn little tricks. The rider's weight, strength, agility, flexibility, reactions, preferences and more will all influence how fast a rider can go and how he or she can do so in the best way for them. In that respect, I think Hotfoot is right on the money. CSS will teach every person a way that will work, safely and efficiently. Level 1-3 will not be enough to make a world champion out of anybody, and the majority will not even be able to take full advantage of the basics they CSS teach them. But for those with the will, determination and skill to move forward, CSS and their level 4 can no doubt help any rider at any level break through new barriers and continue to improve what they already do best. Not knowing any of the CSS personnel in person, and certainly not Keith, I think it is still safe that they would not try to make Marquez ride like Lorenzo or vice verse. Instead, I believe they would focus on each rider's strengths and improve them further while also trying to knock back on the odd weakness so that they can become even more complete. Thanks everyone for their input. Appreciated it. Simon Crafar's "close throttle corner entry" technique by using engine braking and rear brake (after the majority of the speed reduction has been done with the front brake) towards the apex of the corner. Standing the bike as upright as possible and then getting to full gas as soon as possible out of the corner. Or trailing the front brake as far into the corner as possible allowing for the latest braking possible into the corner using none or very little rear brake. I guess I compare the likes of Lorenzo at Yamaha and Mick doohan. Neither used rear brake, ever, except in Mick's case to control the power delivery of a peaking 500 two stroke. Lorenzo is now learning to use the rear brake on the Ducati. I wonder if Simon's techniques reflect more modern sports bikes with higher engine braking compared to the CSS that were developed longer ago with less engine braking? Personally? I have mulled this over for many weeks having first seen Simon's teachings. I can't see from a scientific, engineering, biomechanical or any other way that his technique can the faster than using trailing braking to the fullest. I've not seen a single MotoGP rider do this with the possible exception of the Ducati's. Dovizioso runs a thumb rear brake and this I think changes a LOT. Being able to setup body position and foot position going into a turn and not having to move your right foot for a right hander makes a big difference. I also think Simon's "close throttle corner entry" is simplistic, either by design or otherwise. It may allow some or a lot of riders to ride fast, but I don't think it's the fastest. It's probably safer than teaching trail braking as the worst that will happen is the bike will run wide. But for the absolute top and peak of rider technique, I don't agree with it. Dragging the rear, be that by strong engine braking or actually using the brake, will tighten a corner. So it could be a good idea. Marquez and VInales both use a lot of rear brake. But if you look at Lorenzo, if he gets everything right, his open, fluid style allows him to distance the field while also preserving the tyres. Virtually no hard braking or trail braking or rear brake to be seen. Or so they say. "The "everyman's ideal line" does not exist, and it never will. Different lines are the rider's own personal way of seeing and doing his job: A concatenation of his strong and weak points, dos and can't dos and machine limitations, and, of course, his SR threshold." I think this is why we call it the "art" of cornering, and to me, the differences in riders' style and application of techniques is what makes racing so interesting to watch - and the sport itself so fascinating. Your question is overly simplified for a topic as broad as motorcycles and race tracks. Simply put the fastest technique depends on far too many variables for a single answer. Bike design and HP, Available grip, Camber and Corner radius and track layout all come into play. What works well on a S1k does not work well on a R6 even less so on a RC390. You must adapt your lines and techniques for the machinery and track at hand. Some corners lend themselves to heavy trail brake right to the apex, some do not, sometimes slow in results in faster out. Jump back a few seasons in MotoGP and Compare a Rookie Marquez with Veteran Lorenzo. Their riding styles were diametrically opposed yet their lap times are within a few tenths of a second. Which technique was more correct ? Food for thought, If you were going to enter a secret underground Bloodsportesque fight to the death competition, Would you train with a single dojo and supremely master just one style of marshal art, or would you train with several dojo's and learn techniques from all the styles of marshal art ? I guess from a purely geometry sense, I just can't see how using the rear brake on an antisquat designed motorcycles (read: pretty much all of them, certainly all track bikes and up) results in any assistance in cornering. It certainly helps in reducing speed. But then so does the front brake, to a MUCH higher level. And it also generates better steering geometry. If you setup a bike to steer it's absolute best while on the rear brakes, then it will be very nervous under front brakes and also on the power out of the turns. You setup a bike for 1/4 of the the corner compromising 3/4's of it. That can't be the fastest? This applies for a Moto3 bike or a MotoGP bike. Perhaps you can use some rear brake AS WELL as front to assist in slowing, but then, at maximum braking, the rear wheel will come off the ground so it's of no use. Maybe there's a middle ground while trailing off the brake you should get on the rear brake? Just doesn't make any sense to me. Applying the rear brake moments before the front brake is supposed to reduce the tendency of a stoppie by lowering the bike, putting CoG closer to the ground. Also, using the rear brake while in a corner will tighten your line. I reckon the rear brake is just another small tool that can be used to go a little bit faster around a track - if you can learn to use it as second nature when it's applicable. Applying the rear brake moments before the front brake is supposed to reduce the tendency of a stoppie by lowering the bike, putting CoG closer to the ground. Also, using the rear brake while in a corner will tighten your line. The trouble is that it is not so easy to get fine control on the rear brake, since you are using your foot (which is encased in a racing boot!) and it is difficult to get the kind of fine control you can get with a hand lever. As mentioned earlier some riders that make use of the rear brake get a hand control for the rear brake, and that seems to make a lot of sense. Of course the best way to evaluate whether at technique works for you, is to try it for yourself and see what results you get. It is important to measure the result somehow, though, as whether it "feels" faster is not always a reliable indicator of whether it is ACTUALLY faster, so a GPS timer that shows acceleration/deceleration and shows speed at whatever points you want to see on the track would be very helpful. Or the BMW datalogger if you have an S1000rr. The CodeRACE program has a great exercise where the rider can ride through a corner multiple ways, and there is a visible speed radar that allows the rider to immediately see which technique resulted in the fastest exit speed of a given corner. It is incredibly enlightening. So - why is the rear brake so much more commonly used on dirt bikes compared to roadracing bikes? I figure it's because of the point-and-shoot style that predominates dirt riding; that environment lends itself to it very well whereas road courses tend to favor cornerspeed. Engine design (single vs I-4) I believe also lends themselves better to each. Not actually having ridden in the dirt, I can only speculate. With low traction offered on gravel, less weight is moved up front during braking, so more braking can - and must be - handled by the rear brake/wheel. I reckon they also back the bike in severely quite often, with a locked wheel, to turn quicker and very low speed. Finally, they use the brake as well as engine/wheel acceleration to control the balance of the bike mid-flight. Doohan always said that he could not understand why anybody would replace the foot brake with a thumb brake if they could help it - he disliked the thumb brake, but had no option since his ankle was fused. So again I reckon it's about personal preferences and what works best for each individual. My experience with CSS and trail braking...is great. Basically, I did my first laps on a track with CSS, and throughout my levels 1-3, I learned to go off the brakes just before my entry point. I think this allowed me to really focus on important parts of my riding: steering input, position, where I look etc...and then, once I got very confident with these parts (not that there is nothing to improve ! I can always improve this), I started trail braking, in some corners, when I felt it...so, at least for me, I feel it was really positive to avoid it at the beginning in order to have one less thing to focus on...to then use it once other things had become more automatic...all a matter of where I spend my 10 dollars of attention ! I'm no pro in the dirt but I do ride in the dirt a lot, both MX and Enduro. Rear brake is used a lot for steering with the rear (backing it in), then getting hard on the throttle. In soft sand and some types of gravel, even mud, if you use the front brake you're on the ground very quickly so the rear is used instead since a lot of people don't have a light enough touch on the front. On a lot of dirt surfaces, wheel/s need to lock to push away to top level of slippery gravel or whatever, so that the tyre can grip the harder surface underneath. Like I said I'm no pro, but I've done laps of MX tracks where both wheels are sliding into the berms in every corner before powering away to the next jump and it feels completely under control. One thing that helps a lot from dirt riding is feeling grip levels and getting used to having the tyres sliding. It really helps on the road/track because the SR of chopping the throttle if the front or rear starts sliding just doesn't happen. Not that I've had a lot of front end slides (none with slicks, only on road tyres), I try and avoid those! I took a beginner course in gravel riding earlier this fall. After some slow slalom stuff standing up we did maximum braking in some really deep and loose gravel. We learned to pull clutch, shut throttle, apply rear brake and lock wheel, apply and modulate front brake. In that order, but in quick succession. Having ridden quite a bit on snow and ice, I had little trouble with the test. Next was riding over a small mountain on gravel littered with stones and potholes. That also went well. After an hour with basic practice I joined the fast group, which wasn't all that fast. 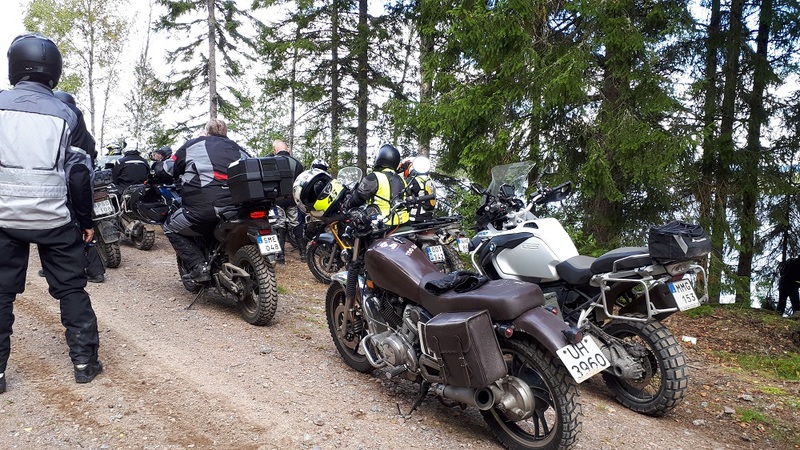 Got a tip from a guide at a coffee stop to stand up, keep most of the weight on the outside peg and push with the outside knee against the tank, let the front end wander and steer with the throttle. Something clicked and I went from being almost afraid of loose gravel to searching for it, enjoying having both wheels sliding about. Last week my wife bought a 1992 CB750 that had been well cared for. 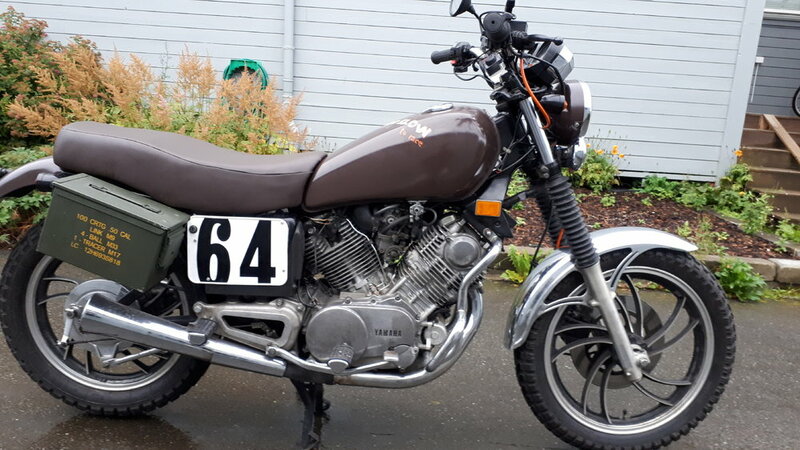 Thank you for calling my bike nice, although we both know it is rather ugly Your Nighthawk, however, is in a stunning condition A friend has one, and while I like the way it looks (not unlike the VT500FT Ascot I once owned), it doesn't do anything for me while riding. Seat is big and inviting, but so soft my bum quickly gets on fire. And the engine is rather lackluster in performance, and also manage to feel even tamer and slower than it is. Suspension lack damping, but is very good at flattening out frost heaves and as such worked very well for me. Albeit basic, the brakes also work remarkably well. When Cycle World tested one in 1991, they actually stopped the Nighthawk in a shorter distance than the period race reps.
Simon possibly thinks he knows what CSS teaches but only has former students' information about CSS to try and glean what is taught. That's the dictionary definition of the word hearsay. He never did any of our schools. Often these students who hop around to different trainers misunderstand pretty much anything they are told and then give each subsequent trainer a foul impression of other trainers who came before them. The biggest problem/confusion is that there is not one. Simon says to turn with the throttle off, Keith says to get the throttle on when the steering is completed. Those two are the same thing. Now to take up your points on anti-squat and "better" steering geometry. It appears that your surface understanding of a truly complex subject of motorcycle geometry will only get you tangled up in a ball of yarn unless you seek to further educate yourself--outside motorcycle forums. Your biggest clue would be to seek out what "trail" is and what "normal trail" is and what happens to it when the front brake is applied, and seek to differentiate between "turning", "leaning" and "carving an arc". Also what an increase in trail mid turn would do for a motorcycle.